Once you’ve connected your social profiles, you can use any of them to log in to SmarterQueue. For instance, if you’ve connected a Twitter profile as one of your social profiles on SmarterQueue, you just need to be logged into that Twitter profile in your browser. Then, simply choose Login with Twitter on the SmarterQueue login page, and you’re in. This is very useful if you want to give your team access to your SmarterQueue account without sharing your password. However, this only works with Twitter and Instagram accounts, as Facebook and LinkedIn connect through personal accounts, which may not be appropriate for team sign in. 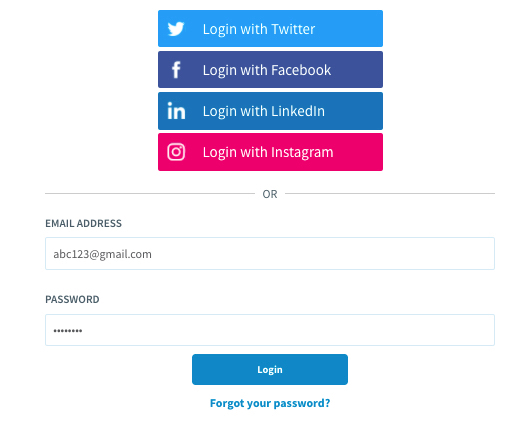 You can disable social login on a per-profile basis (e.g. if they don't want one of their clients using social login to access the whole SmarterQueue account). You can find out more about Login Security if you'd like. This also applies if your team shares access to a Facebook Page/Group, as these are not suitable for social sign in.